Duval has twelve different blocks — A Block to L Block. Four blocks have ground floors, all blocks have a mid and a top floor. Each floor has around eight people mixed by gender, at different stages of their study. Gym:equipped with treadmill, bike, stepper, rower, weights machine, and punching bag. A new communal kitchen equipped with ovens, hotplates, microwaves and a fridge freezer was opened in 2016 for cooking main meals. 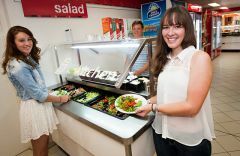 Residents can access this facility 7 days a week from 7am – 9pm; inside and outside dining areas are available. Junior Common Room: a welcoming, cosy space for that lazy Sunday afternoon in front of the fireplace, but also hosts pre-dinner drinks for many formal dinners and even converts to a heaving dance floor. 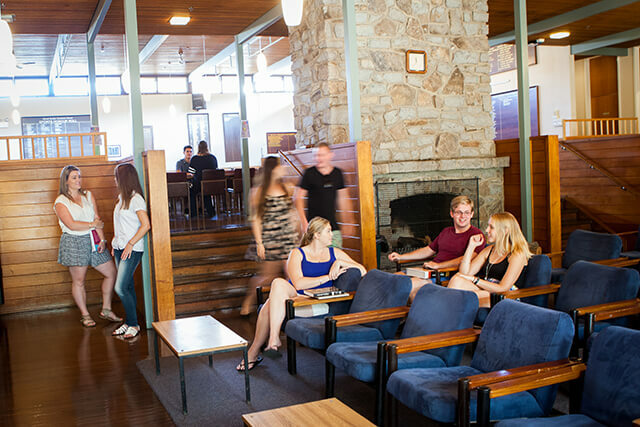 Senior Common Room: for senior students with kitchen facilities, couches and bean bags, and pay TV. It's a quiet place for our senior students to relax. 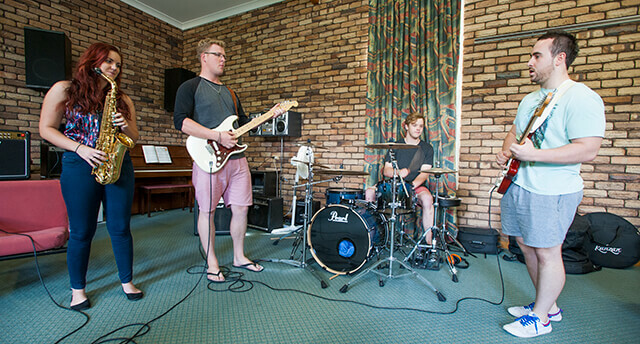 Music room with piano, drum kits and other musical equipment, and anyone who plays an instrument is encouraged to bring it along to college. Entertainment Centre: Duval's entertainment centre, 'Tanderra', has comfortable chairs, a big screen LCD TV and DVD player, as well as a pool table and football tables. There's also a large space for College meetings, yoga, band practice, aerobics and a variety of study groups. Our own bike shed for the storage of motorbikes and pushbikes. Residents can get a key to this secure building from the College office. A shared laundry in each Courtyard. Washing machines are FREE but residents need to provide your own washing powder. There are also ironing boards with irons, drying rooms, and clothes lines. Duval College has two courtyards where you can study in the shade or kick a ball around with friends, and celebrate birthdays. Our courtyards are a favourite place for social get-togethers. 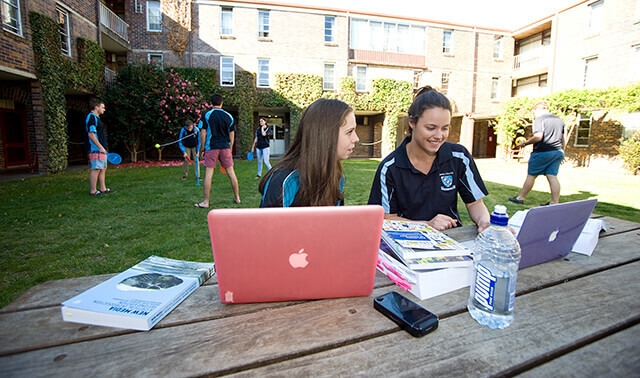 Brick Courtyard adjoins the Junior Common Room — this is where most College functions start and finish with drinks or nibbles. Barbecues and band nights are also hosted in the courtyard. Surrounded by gardens, 'Brick' is a popular spot to hang out. Kitchenette: Every kitchenette has a fridge, sink, microwave and kettle. Many students also bring other appliances, from toasted sandwich makers to milkshake makers — check the list of what to bring to check requirements for bringing electrical appliances. Bathroom: Most bathrooms have two sinks, two showers and two toilets. Some bathrooms even have bath for a good soak after a long day of lectures. Cleaning service: Bathrooms, kitchenettes and common areas are regularly cleaned by our dedicated housekeeping staff. Duval has around 8 single study rooms per floor, with shared bathroom. The dining experience at Duval College is at the centre of your residential life. The dining hall is a beautiful room with dark floor boards, subdued lighting and surrounded by the honour boards and trophy cabinets that celebrate the achievements of our residents. 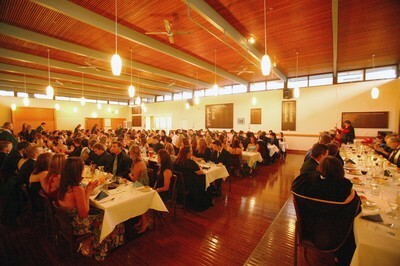 The dining hall hosts events such as formal dinners, trivia nights, awards nights, talent nights and charity events. It is also where we decorate a large Christmas tree to celebrate Christmas in July. The Duval College meal package offers 5 dinner meals Sunday - Thursday. Other meals can be purchased from Austin College Dining Hall - Walters Cafe, or one of the other food venues on campus, including SportUNE, the Booloominbah Collection, Cafe Life, and the Natural History Museum's Cafe 77. Duval College holds many celebratory dinners throughout the year that celebrate the history, traditions and achievements of the College and its residents. These dinners are usually formal or semi-formal with drinks and nibbles on arrival and sumptuous two course meals. There is usually a guest speaker or award presentation and residents are expected to dress formally often including academic gown. speeches, awards, formal gear and academic gowns. The calendar includes Sports Awards, Valedictory. Formal dinners are included in your College fees. 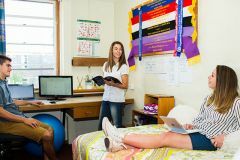 Every student's bedroom is a quiet and relaxed study area with plenty of shelf space and a huge desk, but bed can also be a comfy place to catch up on some lecture notes or some class readings. Close by, the courtyard is also a great place to sit in the shade and get some study done. One of the great things about College is that you can always find another student doing the same subjects with whom you can compare notes or check assignment tasks. Meeting Room: The Duval Meeting Room, is used for College meetings and conferences. Computer Room: Equipped with computers, high speed internet, relevant software, colour printer/scanner and photocopier, the computer room is air conditioned to maintain year round comfort. Library: The College library holds novels and textbooks covering a range of courses as an addition to the main UNE Dixson Library. It's also a quiet place for students to study in peace. Thesis Room: This is a computer and study room designated for postgraduate students. It's a quiet, undisturbed environment allowing concentration on thesis or PhD writing. Dining Hall: Don't be fooled by the name ... the dining hall is also a good place to study. 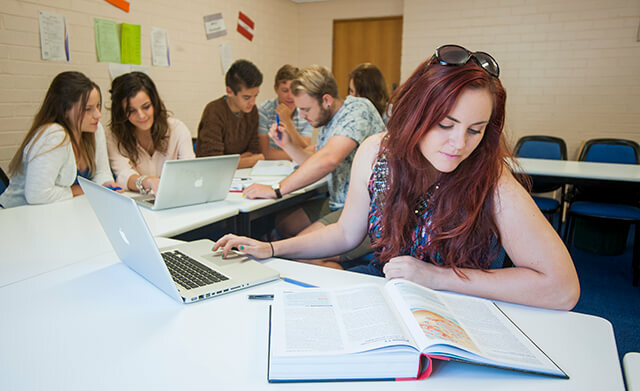 It's quiet during the day, with plenty of study room on the long tables where big groups can easily study together. 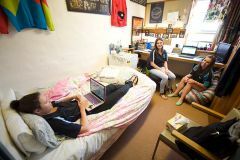 The College study night—'Might-as-well-Monday'—involves all students bringing their books, notes, and laptops to the dining hall to study together. Mentors are on hand to help with any questions and to help get the brain working.